Might Bite is unlikely to race before March's Cheltenham Gold Cup after undergoing a procedure to help his breathing, says the chaser's trainer Nicky Henderson. The 2018 Gold Cup runner-up was last on his seasonal reappearance at Haydock in November and seventh of seven finishers in last week's King George VI Chase. A trickle of blood was found coming from his nose post-race at Kempton. "Our only priority is his health and well-being," said Henderson. He explained that the 10-year-old would have his palate cauterised, an operation which he also underwent in 2016. "Timing-wise we are absolutely fine, as he'll miss less than two weeks work, which shouldn't hold him back too much as he's already race fit," the trainer added in his Unibet column. 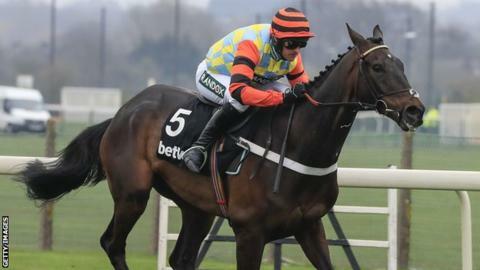 "But it would almost certainly rule him out of running in anything before the Cheltenham Gold Cup. "He didn't run again between Kempton and the Gold Cup last year, so it shouldn't make any difference again." The horse looked out of sorts at Kempton, finishing well behind the winner Clan Des Obeaux, prompting concerns from Henderson. Might Bite is one of jump racing's enigmas - a huge talent but unpredictable. The chaser was set to win at Kempton on 26 December in 2016 before a heavy fall at the final fence, but recovered to land the RSA Chase at the Cheltenham Festival, albeit after wandering around on the uphill finish before winning by a nose from stablemate Whisper. Henderson's gelding - ridden by Nico de Boinville - won last season's King George, was runner-up in the Gold Cup and then won again at the Grand National meeting at Aintree before two bitterly disappointing runs this term. Sent off the 4-1 favourite for last year's Cheltenham Gold Cup, the 10-year-old son of Scorpion is available at odds ranging from 10-1 to 16-1 for this year's race on 15 March. But which Might Bite will turn up in 10 weeks' time is anybody's guess.